If you’re getting ready to sell your children’s clothes, it’s time to dive into the world of online shipping. Purchasing postage through PayPal and USPS.com can save you both time and money. When shipping, PayPal shipping should always be your first choice. Packages under 13 oz can be sent First Class. It’s very important to know that a shipping weight is always rounded up. So if your package is 13.1 oz, it has to be sent Priority Mail. Below is a table showing the differences in shipping costs between taking a package to the post office and shipping through PayPal. As you can see the savings range from $0.40/package to $0.65/package. While it may not sound like much, you are also saving yourself a trip to the post office. Online shipping is not difficult, but it does take some getting used to. First, you will need some supplies. Amazon is a great source for reasonably priced shipping supplies. You can always go to Staples, but you will find that their supplies are significantly more expensive than buying ahead at Amazon. Once you have your supplies and have made a sale, it is really easy to prepare your shipment. Fully package the items. Weigh the items (in the shipping packaging) on your scale. If it is under 13 oz, go to PayPal (we will discuss over 13 oz next). Next to the transaction, you should see a “print label” button. Enter the shipping weight and click the purchase button on the bottom of the screen. Print the label, affix to the package and you’re all set! You can leave the package in your mailbox, in a blue box (if under 13 oz) or schedule a pick-up online. The tracking for your package automatically uploads in PayPal and your buyer is notified of the shipment. If your shipment is over 13 oz, you have a couple options. The first thing to do is to ask the buyer what their zip code is. Priority Mail has two different options. First, regular Priority Mail is distance based. So if your buyer lives a state or two away, this is often cheaper than the second option, Flat Rate. Flat Rate is the same price, no matter where you are shipping. USPS.com offers free packaging for flat rate options. You simply order online and they are delivered within a week to 10 days. I find that the most useful are Padded Flat Rate Envelopes, Regional Rate A1 Boxes, and Regional Rate B1 Boxes. Once you have your buyers zip code, weigh the package and put the details into the USPS online shipping calculator. This will tell you the cheapest way to ship. Regular, distance-based, Priority Mail postage can be purchased on PayPal like a First Class Package. PayPal also supports Small, Medium & Large Flat Rate Boxes (these can be ordered online or picked up at a Post Office). 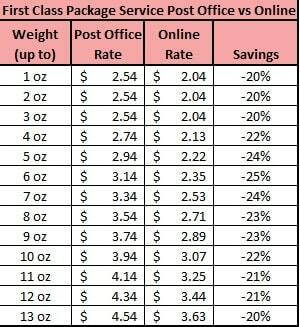 If you will be using a Padded Flat Rate Envelope or Regional Rate Box, the postage must be purchased at USPS.com. When shipping through USPS.com, there is the option to notify the recipient of shipping by providing their email address. This is a great way to let the buyer know that the package has shipped and ensure that they have the tracking available. The rate between a cardboard Flat Rate Envelope and Padded Flat Rate Envelope is different. Using the wrong type of postage could result in postage due when the buyer receives the package. It should also be mentioned that not all Priority boxes and envelopes are flat rate! Be sure that if you are using Flat Rate postage that “Flat Rate” is printed on the box or envelope that you are using. It can be a costly mistake! That’s the basics! Follow us for a future post on shipping to Canada and internationally. This post contains affiliate links, KidzBuyz may be compensated for purchases made through these links, for more information, click here! Previous Post 6PM: Extra 10% off – Today only! Next Post Mabel’s Labels: 30% off Ultimate Back to School Combo!